My bike was at work on Monday, so I rode in on my hardtail, but couldn’t ride it back because it doesn’t have lights. I chose this over our “wheels stay on” racks just because it doesn’t project forward of the front mounting point, which would require a longer trailer hitch. It’s very solid, although I had to use a couple of small bits of wood to pad out the clamps. 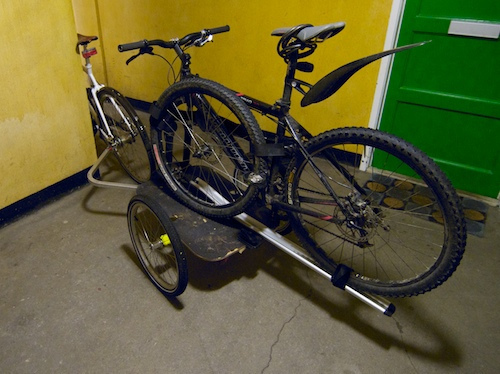 Very rideable, but with quite a high centre of gravity I did manage to roll the trailer (!!) just outside the office – dropping off a high kerb at an angle and steering round the roundabout at the same time, the wheel that was last off the kerb bounced up again, and up.. and up… should have steered into the turn, but working out how to do that while staring over your shoulder is pretty difficult! Hi Dave. I have carried a bicycle on my CFY Large. I turned the steering round 180, then it was short enough to ride inverted on the platform. Obviously not so good with drop bars, but maybe by swivelling them in the clamp? I like your pages – JJ. Thanks JJ. Just the things that keep me interested! I see you’ve made a homemade lamp. Something I’ve always fancied trying (or maybe, taking existing lights and integrating them into a frame all neat and proper).